You may be thinking that all of these things together would just cause an unwarranted furor in the mouth, well there is a final ingredient that i have left out for effect, one that has long been a bringer together of flavours, an addition of richness and a subtle thickener. The addition of cream wasn’t just a seminal choice either, as many of you know, drinking milk with something spicy reduces the sensation of heat and cools the mouth and stomach. My boyfriend isn’t the biggest lover of spicy foods, but I couldn’t pass up on a little bit of curry on a Tuesday, so i compromised and added the cream. Result? A delicious well balanced meal that wasn’t too hot or too bland. Brown your chicken first in small batches, until just white, set aside to fry the onion (1/2), in a separate pan prepare the beans by frying them in good butter, then add cherry tomatoes and beans at the same time, the sauce, when the ‘cherries’ are blistering add the chicken in and you Portuguese sauce, mix with cream (2 tbsp), put a lid on it for a couple of minutes to infuse THEN add you noodles for a final stir-thru. 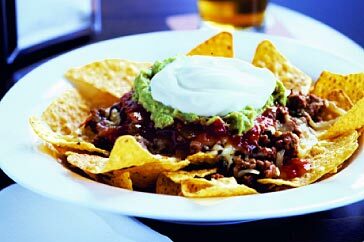 If your looking for an amazing snack, (or meal for that matter) then look no further than this beef nachos recipe. Nachos is easily one of my favorite foods, and is possibly the only thing I would choose to eat over chocolate. Nothing compares to the taste of the crunchy cornchips mixed with the smooth sour cream and salsa, and not forgetting that all important melted cheese! This recipe I found on taste.com, uses some extra ingredients that really make the nachos stand out. 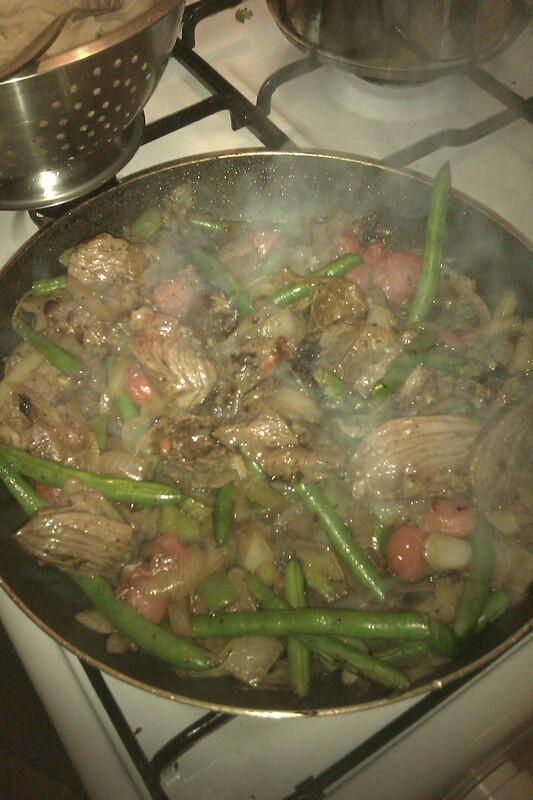 It uses beef mince, kidney beans, chili powder, as well as the other traditional ingredients. Usually nachos is seen as more of a snack, but this beef nachos recipe is definitely a full meal, and a delicious one at that. It’s quick and easy to make, and serves four people, but don’t worry, I won’t tell that your making it all for yourself. Preheat oven to 200°C. Heat oil in a non-stick frying pan over medium heat. Cook onion for 2 minutes, or until soft. Add mince. Cook, stirring with a wooden spoon, for 5 minutes or until browned. Add kidney beans, chilli powder, seasoning, tomato paste and water. Reduce heat to medium-low. Simmer for 5 minutes, or until thick. Stir through coriander. Arrange corn chips on a heatproof plate. Top with mince. Sprinkle with cheese. Bake for 15 minutes, or until hot. Top with salsa, avocado and sour cream. Serve. This week while I was looking for a recipe to make for dinner, I came across this yummy looking vegetable lasagna. Now usually I prefer the meat lasagna, but I thought I would try this slightly healthier alternative, and I was pleasantly surprised with the results. This recipe is super healthy, as the mixture of vegetables and low fat ingredients such as light sour cream and low fat ricotta means that you can go back for seconds without feeling guilty. There are a few ingredients involved with this recipe, but it only takes around twenty minutes to prepare and around 70 minutes oven time. Another great thing about this recipe is that you can put the leftovers is the freezer in individual portions, then you can take it out and reheat it at work for lunch or save it for dinner another night. This lasagna is also great for vegetarians or picky eaters, as you can really substitute any vegetables you feel like into the dish. I highly recommend this delicious lasagna! Preheat oven to 180°C. Spray the eggplant with oil. Heat a non-stick frying pan over medium heat. Cook one-third of the eggplant for 1-2 minutes each side or until tender and golden. Transfer to a plate lined with paper towel. Repeat, in 2 more batches, with remaining eggplant. Spray the pan with oil. Cook the mushroom and garlic over medium-high heat for 3 minutes or until soft. Add the spinach and cook for 2 minutes or until wilted. Remove from heat and stir in the sour cream. Season with salt and pepper. Spray a 3L (12-cup) capacity baking dish with oil. Spread 125ml (1/2 cup) of the passata over the base. Top with 2 lasagne sheets, overlapping slightly. Top with half the mushroom mixture, half the eggplant, half the capsicum, half the ricotta and half the basil. Top with 2 more lasagne sheets and 160ml (2/3 cup) of the remaining passata. 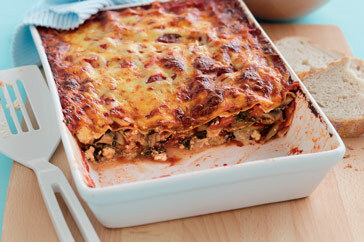 Continue layering with the remaining eggplant, capsicum, ricotta, basil and lasagne sheets. Breakfast is the most important meal of the day. And it’s probably true, though I admit to leaving the house most mornings having eaten (or drank) nothing more than a cup of tea or hot chocolate. It’s the mixture of early mornings, lack of hunger and lack of time that make breakfast my least appealing meal during the week. This changes on the weekends however, and when I can be bothered I like making a big delicious breakfast. Though I like the traditional pancakes with maple syrup, for my ultimate breakfast, nothing beats the classic bacon and eggs. To be honest, if I could only eat the bacon I would still be happy, but nothing tastes better with the crunchy bacon than a soft and gooey egg. This bacon and eggs recipe has a few added ingredients which make it all the more tasty. A healthier take on this yummy breakfast, it uses bacon, eggs (duh), paired with Roma tomatoes, fresh thyme, spinach and served on thick slices of toasted wholegrain bread, or really whatever bread tickles your fancy. This recipe is super tasty, and is the perfect choice on a lazy Sunday morning. Enjoy! Preheat grill to mediumhigh. Cut the tomatoes in quarters lengthways. Place on a rack over the grill pan. Combine the thyme, oil and some salt and pepper. Drizzle over the tomato and grill for 6-8 minutes or until softened. Transfer to a plate and cover to keep warm. Place bacon onto the grill tray and cook for 4-5 minutes or until cooked to your liking. Keep warm. Meanwhile, bring a saucepan of water to the boil. Add the vinegar. Make a whirlpool, then drop the eggs into the water one at a time. Reduce the heat to very low and cook for 2-3 minutes for soft boiled. 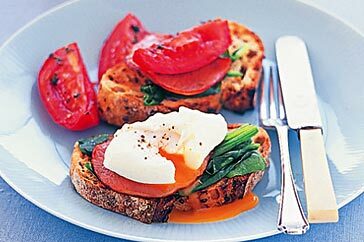 Use a slotted spoon to transfer to a plate with the bacon, spinach, tomatoes and toast. Pasta is easily one of my favorite foods, it combines two of the best features of cooking when your feeling a little lazy; its quick to make and it tastes amazing. This pasta recipe is no exception. 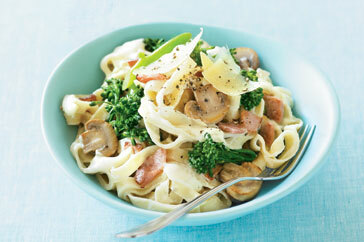 Just hearing the name ‘creamy bacon and mushroom fettucine’ leaves me salivating. Now I’ll admit, I’m usually not a big fan of the creamy pasta sauces, as they sometimes go a little overboard in the richness factor, but this recipe from ‘taste.com’ has just the right amount of creaminess, and the other ingredients cut through any richness. The use of low fat bacon and cheese means theres no need to feel guilty after eating this dish, at least thats what I told myself. This pasta serves four people, and has a preparation time of 15 minutes, so it’s perfect to make when you get home from work or school or when your expecting a couple of friends around. So try this delicious pasta out for yourself, I guarantee you won’t be sorry! Cook pasta in a saucepan of boiling water following packet directions or until al dente. Add the broccolini in the last 2 minutes of cooking. Drain. Meanwhile, heat a non-stick frying pan over medium-high heat. Add bacon and mushroom and cook for 5 minutes or until tender. Transfer to a plate. Melt the spread in a saucepan over medium heat. Add the flour and cook, stirring, for 30 seconds or until combined. Remove from heat. Gradually whisk in milk and cream until combined. Place over medium heat and cook, stirring, for 3-5 minutes or until mixture boils and thickens. Add the cheddar and shredded parmesan and stir until melted. Add the pasta mixture and the bacon mixture to the pan and stir until combined. Divide among serving bowls. Season with salt and pepper and top with shaved parmesan to serve. So it’s that time of the year again, the time when words like “invention test’ and ‘immunity challenge’ are thrown into our everyday conversations, and the time when cooking becomes cool again. Yep, I’m talking about Masterchef. Now usually I’m not a big fan of the ‘cooking reality show’ genre, aka, My Kitchen Rules, but there’s something about Masterchef that no matter what else is going on, I’m always tuned in every night at 7.30. Perhaps it’s the contestants and their ability to create a delicious three course meal out of nothing more than a piece of lamb and some vegetable stock, or the likable judges, who each bring their own different styles to the table (pardon the pun), and work hard in helping and inspiring the contestants, though Matt Prestons infamous cravats are a little much for my liking. Each of the challenges the contestants are faced with are exciting,especially when their faced with the task of making steamed octopus into a meal thats, well, edible. I admit to getting a tad nervous whenever I see one of the contestants running out of time in preparing their dishes and am prone to yelling out encouragement to my tv screen. As you can probably tell, I get quite attached to the contestants, and am usually left shattered when my favorite people leave the show.Every time Masterchef finishes I always feel the urge to cook something really extraordinary, like the famous croquembouche cone from last years competition, though cupcakes are usually the extent I go to. I love pasta, all sorts, especially the egg pasta ‘nidi’. For those of you who are avid readers of the blog, you may have noticed I have a slight penchant for Kangaroo, for its rich tasting meat with low saturated fat ( any fat in fact) and its versatility. I first seared off the steak (bought from coles pre marinated in a sweet garlic and herb marinade) and let the meat rest whilst i used the same pan to fry off an onion, followed by a capsicum, then green beans (fresh) and finally some really ripe cherry tomatoes. the onions were glistening and translucent before i added the other vegetables and at this stage i also added some dired basil and oregano. Once the tomatoe skins started to wrinkle i cut the meat into slices about 1 cm thick (use a sharp knife) and mixed in the meat with the veg. meanwhile i boiled some pasta (nidi for me but any ill do) and once this was ready ( a little bity still but soft on the outside) i prepared the bowls with a layer of pasta. The great part about this recipe is there isnt a sauce as such so each bite carries the flavour of each ingredient in the dish. the roo is such a decadent meat to enjoy, i didnt want to mask its strength with really overpowering sauces. Ever get home from work of school and feel like you might just drop off the earth if you dont sit quietly for a few minutes? 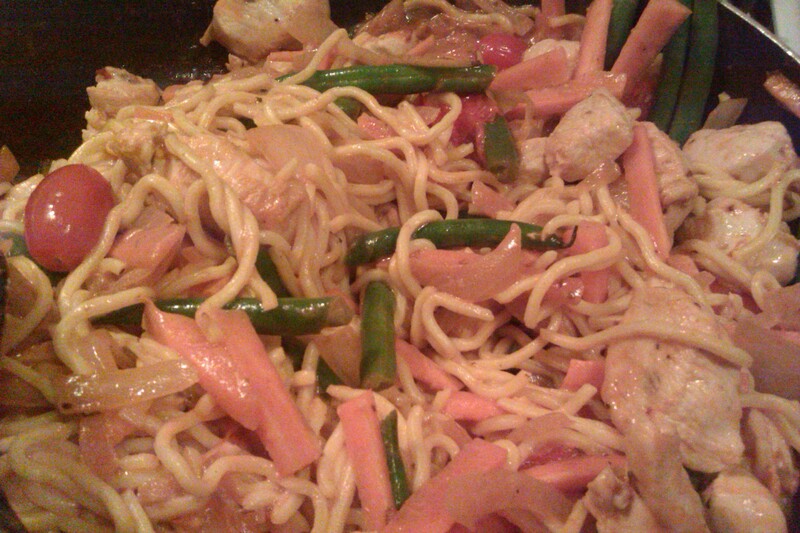 here is a warming EASY meal for those days. It only requires the briefest of preparations once cooked all you need is a fork and a couch. Select a large or two small potatoes from your pantry, I always keep a bag in there just for these times. Cut about ten slices of cheese or grate cheese till you have a small heap. If you have pasta sauce this can be added. 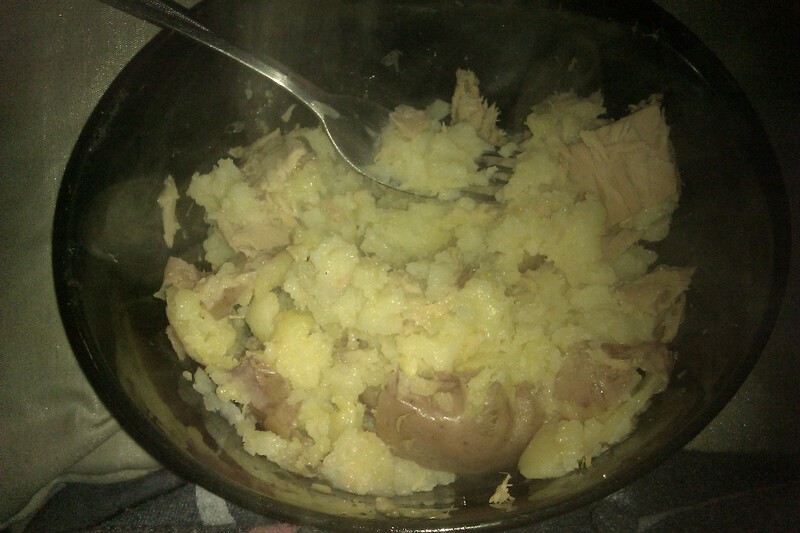 Microwave for between 5 and 10 minutes, check at 5 if the potatoes are soft when you poke them with a fork, if so they are ready. Add the can or leftovers and pasta sauce and top with cheese. Place back in the microwave for 1 further minute to melt and infuse the ingredients. Careful removing the plate/bowl it will be hot! Salt as necessary and eat while its hot! Never has a desert had as much impact as Chocolate Cake. There are so many variations of this classic cake, ranging from mud cakes, flourless cakes, low fat chocolate cake and endless others. 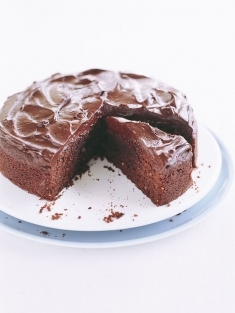 To me however, nothing beats a classic chocolate cake. and by classic, I mean lots of butter and lots of chocolate! This recipie taken from the Donna Hay website, has a couple of added ingredients, that being almond meal and cream. These just add to it’s delicious taste, and seeing as it’s a Donna Hay recipe, I’m sure we’re in good hands! This cake is great to make for family gatherings, or even better if your in one of those moods where only chocolate will help, then this is the cake for you. The chocolate fudge icing is an amazing touch to the cake, just be sure to leave some leftover in the bowl! So whatever mood your in and whatever the occasion, this cake is sure to cure even the most serious of chocolate cravings! Preheat oven to 150°C (300°F). Place the chocolate and butter in a saucepan over low heat and stir until melted and smooth. Set aside. Place the eggs and sugar in the bowl of an electric mixer and beat for 8–10 minutes or until pale and thick. Sift the flour and baking powder over the egg mixture. Add almond meal and gently fold through the chocolate mixture. Line the base of a 23cm-round cake tin with non-stick baking paper. Pour in the mixture and bake for 50 minutes or until cooked when tested with a skewer. Cool in the tin. For the chocolate fudge icing, place the chocolate, cream and butter in a heatproof bowl over a saucepan of simmering water and stir until melted and smooth. Remove and set aside to cool completely. Beat in an electric mixer until thick and fluffly. Spread icing on the cooled cake. Serves 10. Today, it was wet and cold and my boyfriend and.I didn’t feel too much like entering the world. Best way to spend a day inside and totally shut off? About a million episodes of Make It or Break It with SCONES! Without having a copy of stephanie or Margaret’s seminal classics at hand, I turned to the interwebs in taste.com for their quick scones recipe. They didn’t mention a glaze.and.I really love a hot scone that is a little crunchy. So, I separated an egg, wisked the yoke and poured a little over each Scone.before cooking them. Today I used a fork to spread the yoke but I would recommend to use a cooking brush for a better application results.